In late 1993, the Director of Computing Services at Dartmouth College stopped by my office and handed me a floppy disk (remember those?) and told me to check out what was on it. It was a copy of NCSA Mosaic 0.9b. I think it was only an hour after I began playing with it that I poked my head into his office and said, “Larry, any problems with me making a website for Dartmouth College?” Not long after, Dartmouth’s first website, one of the first 50 college sites in the world, was online. (Alas, the only surviving relic from that site is the last banner I did in 1995). In 1995, the volume of support calls to Dartmouth’s User Services Consulting line (the main point of contact for technical support for the college and all of its graduate schools) was so great that we decided we needed to do something to manage the flow and ensure nothing was slipping through the cracks. Of course, we had a limited budget so a proper CRM tool was out of the question. I volunteered to take this problem on and developed a home-brew CRM system by cobbling together Dartmouth’s own Blitzmail, Userland Frontier, FileMaker Pro, and some AppleScript to glue it all together. The resulting system was still in operation 4 years after I left Dartmouth. DisabilityDirect.gov Site with callouts showcasing accessibility features. 2002. In 2001, I was hired to manage a project to build out Disability.gov (then DisabilityDirect.gov, later DisabilityInfo.gov). The mandate was that the site had to be compliant with Section 508‘s accessibility requirements. The directions I received from my client at the Department of Labor was to create a graphical site and a separate text-only site (that drew its data from the same database). 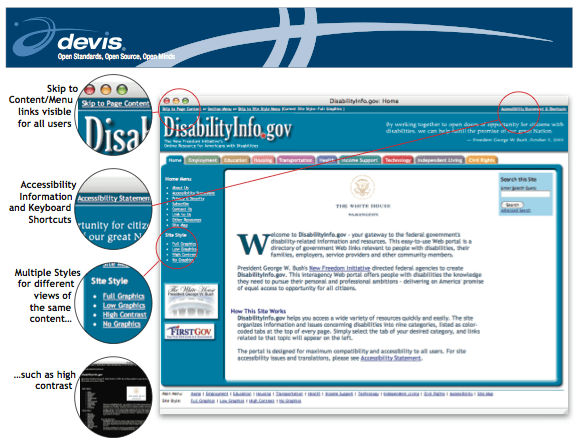 I instead did some research and pioneered what I called Usable Accessibility, the idea that websites can be rich and graphical and still be highly usable and accessible to the disabled. The site that I designed was an exemplar at the time of accessible web design using standards-compliant HTML and CSS instead of tables for layout. 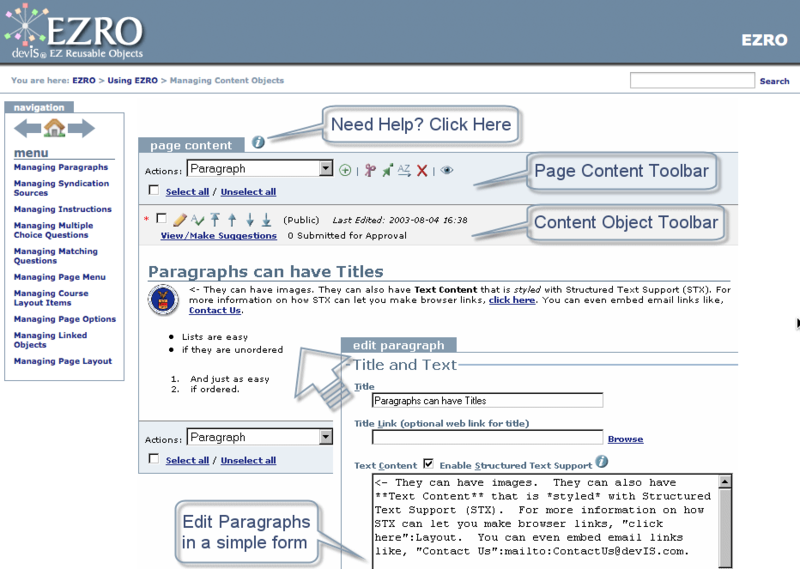 In 2004, growing out of the work on Disability.gov, I designed and managed the project to create EZRO (EZ-Reusable Objects) a SCORM (see also marketing sheet (pdf link)) compliant Learning Management System (LMS) that was fully accessible (both the content development side and the client side) and I wrote a white paper on accessible e-learning (pdf link). This, in turn, lead to a number of speaking engagements at e-government conferences in the DC area and one in Amsterdam, NL. In 2003, I learned about Podcasting and decided to write an article about it. I interviewed Dave Winer who, along with Adam Curry, is credited with inventing podcasting (Winer created the RSS standard that allows podcasts to be syndicated while Curry created the first podcatcher to subscribe to and download podcasts) and TidBITS published my article, Podcasting: The People’s Radio. I had originally intended it to be a two part article, the second part being a more techinical look at how to produce a podcast but we decided to turn that into a book instead. Soon after, they published my ebook, Take Control of Podcasting on the Mac. The book was in continuous improvement until 2009 and then took a 5 year hiatus. The 3rd edition was released in June 2014. I learn incredibly fast. My boss from my Dartmouth days once said that if we both received new copies of Photoshop, by the time he got the plastic wrap off the box I’d already know all of the keyboard shortcuts. This is why I love new technologies and finding innovative ways of using them. It’s a chance to learn, which in turn benefits my employers they have a resource they can speak to about potential new directions or technologies to embrace.